Today's news from Ofcom is of no comfort to you if you can currently only get an ADSL or ADSL2+ service, as the headline of the UK average broadband speed increasing to 14.7 Mbps will mean nothing to you. The Ofcom report if you actually look beyond the headline figure reveals that the improvements are in largely down to Virgin Media continuing its speed upgrade programme, and a higher proportion of people ordering superfast FTTC based services. In some ways the report is more important to the marketing people who if selling an up to 30 Mbps and getting an average speed of 30.6 Mbps will be the most excited, though do remember what Ofcom tells you "These ranges are not a description of the range of speeds actually measured". These ranges reflect the average speeds that would be achieved 95 times out of 100 if the exercise was repeated with 100 sets of different panellists. If the range of two operators overlaps, then these operators offer comparable performance. These ranges are not a description of the range of speeds actually measured. There is the inevitable widening of the urban rural speed gap, where urban speeds are 26.4 Mbps. but rural areas are just 9.9 Mbps, compared to 13.5 Mbps versus 4.1 Mbps two years ago, but with the on going improvements to broadband speeds across the UK this is to be expected. Unless providers were forced to not sell a faster service until everyone was able to order the new service. The divide is inevitable the question really is whether people believe the political announcements of 90% by 2015, which has now morphed into 95% able to order superfast by 2017, even though the original 2015 projects are only just starting to deliver. We have looked at the data from our own speed test for the various providers over on our blog, including products not covered by the Ofcom research e.g. 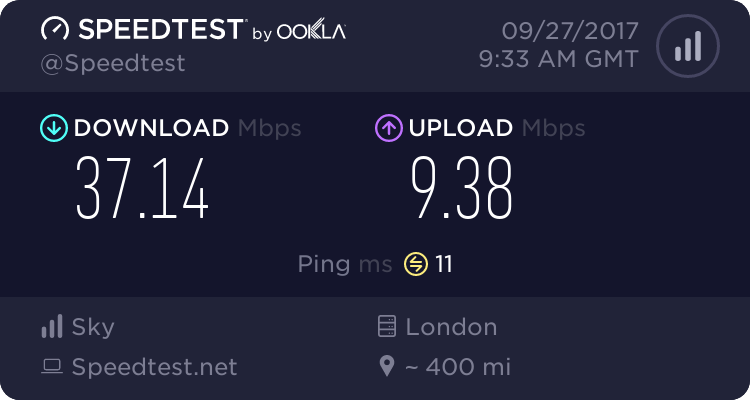 Sky fibre services and while our speeds may look lower, we are not applying any weighting to these results, and don't exclude people based on their line length and the results include a mixture of Ethernet and wireless connectivity. The report is from the thinkbroadband site, but I do agree that the checkers used actually are not up to the job. I raised this on the thinkbroadband site a little while ago. As for the speedchecker available on this site, this has been raised previously. Hopefully Ged can get back on the case soon.